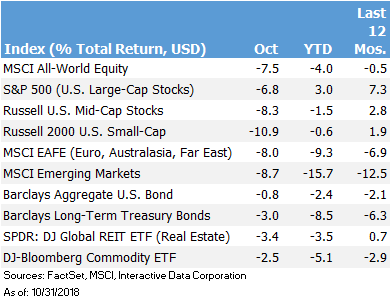 October lived up to its billing as the scariest month, with the global MSCI All-Country World Index falling 7.5%, leaving it down 4.0% for the year. US stocks, which had previously held up amid weakness abroad, fell 6.8% in October. Bonds, which usually zig when stocks zag, also saw selling pressure as interest rates rose. For the second time this year, stocks suddenly retreated 10%, leaving investors wondering what’s behind all this volatility. The rise in interest rates spooked the markets. Yields rose quickly in January and February this year and then again in September and October. Interest rates are the building block on which all assets are priced. Higher interest rates mean stocks must offer better returns, which usually means lower prices today. Tariffs are disrupting global supply chains. Anecdotal evidence from global companies suggest trade policies are disrupting business, forcing manufacturers to find other sourcing of goods or game the current tariff system. No one knows how trade negotiations will play out with China, the main tariff target. For markets, the uncertainty may be worse than the direct impact to trade. There is talk of peak earnings. Halfway through Q3 earnings season and companies have reported earnings 6.5% above expectations, better than the 5-year average of 4.6% according to FactSet. However, investors have taken a glass-half-empty perspective, choosing to focus on the possibility that earnings have peaked. The mid-terms create uncertainty. History shows that stocks do not favor one political party and often perform best when congress is divided. Still, the upcoming election adds to the level of uncertainty that is unnerving the markets. The biggest challenge investors face is sorting through all the noise and focusing on long-term objectives – and much of what seems so important today will turn out to be inconsequential noise. The fact that stocks have strung together nine straight positive years makes recent downturns seem more frightening. At this juncture, no one should be surprised that stocks are more volatile or that gains are becoming a little harder to come by. The 10-Year US Treasury yield is up 0.72% this year. After three rate hikes by the Federal Reserve, the Fed Funds rate reached 2.25%. Markets expect a fourth hike in December. This is all good news for investors holding cash, but the worry is that interest rates may be going higher. That shift to higher rates can pose a headwind for all financial assets if it comes unexpectedly. Holding high quality bonds normally offsets the downside for stocks. In the short-term, that relationship does not always hold. October and September offer a case in point. Stock prices were down, bonds had negative returns, and commodities languished, leaving even well-balanced portfolios with small losses. The current relationship between stocks and bonds could be a signal that the market is simply reacting to the mathematical impact of higher rates on asset valuation. If the markets were anticipating a true economic recession, then bond yields would likely fall. Longer term, we believe that a well-constructed portfolio of high-quality bonds will act as a shock absorber for stock prices and provide needed liquidity to get investors through the next downturn. Historically, stock market corrections turn into bear markets as a result of recessions. This time around, the market is primarily driven by higher interest rates, which is a positive sign for the economy. Since 1970 there have been fourteen market corrections, defined as a 10% or greater decline from previous highs. Only six of those fourteen declines correctly anticipated a recession. That’s a worse record than economists who, it is often joked, have correctly predicted eight of the last five recessions. Corrections in the market are always unsettling for investors. When stocks sell off, it isn’t any easier to buy. Those sitting on cash may have been waiting for a 10% drop. But when the correction actually arrives, the worry quickly turns to how much worse it is going to get. We are closely monitoring market risks. We are also actively looking for opportunities in high-quality stocks that may be temporally out of favor. Please contact us if you would like to discuss your financial plan or have specific questions or concerns.